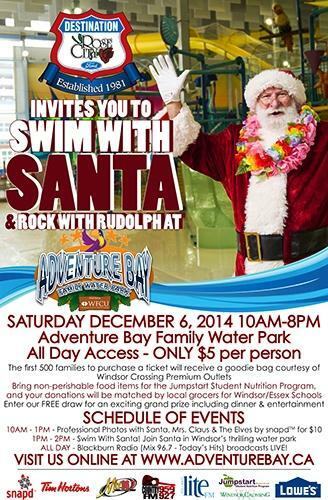 Kick Off The Holiday Season with Santa at Adventure Bay Family Water Park! Saturday, December 6th will be a busy day for Santa. He'll be entertaining and posing for pictures with kids in the Adventure Bay Family Water Park lobby from 10:00AM to 1:00PM then splashing his way into the water park from 1:00PM to 2:00PM as part of the Swim with Santa and Rock with Rudolph event. The celebration of the holiday season lasts all day, and the party continues after Santa moves on to his next stop with lots of holiday fun to be enjoyed until the park closes at 8:00PM. - Enter our free raffle to win an amazing prize package! Jumpstart Student Nutrition Program, working in collaboration with our local school boards, their schools and community partners, projects that 4,360,730 meals will be served during the 2014/2015 school year. These meals, served as snack, breakfast, and lunch models, provide nutritious food selections for the 26,746 elementary and secondary school students attending nutrition programs aligned with 96 participating city and county schools. It is thanks to the generosity of the many volunteers who commit their time to prepare and serve meals, and those who donate cash and nutritious food products that make it possible for sites to meet the needs of local children and youth, enabling them to attend school as students well nourished and ready to learn.